What is God? God is a Spirit, infinite, eternal, and unchangeable, in his being, wisdom, power, holiness, justice, goodness, and truth. The question, "What is God?" takes for granted that there is a God. The belief of God's existence, is the foundation of all religious worship. "He who comes to God must believe that he is." There must be a first cause, which gives being to all things besides. We know that there is a God by the book of NATURE. The notion of a Deity is engraved on man's heart; it is demonstrable by the light of nature. 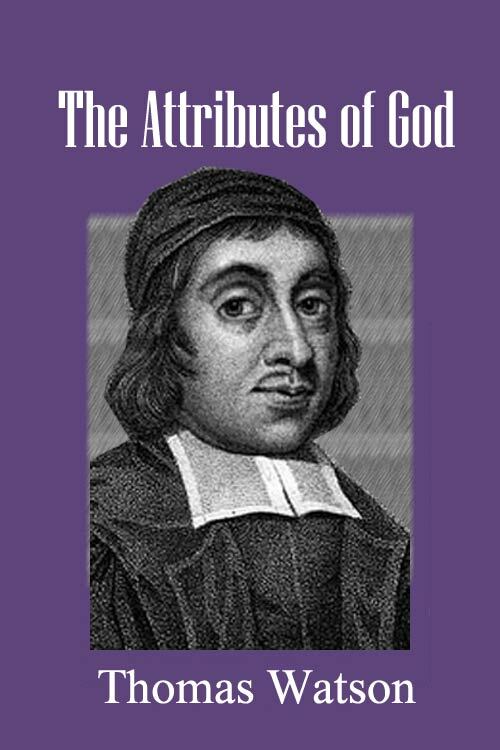 It hard for a man to be a natural atheist; he may wish there were no God, he may dispute against a Deity—but he cannot in his judgment believe there is no God, unless by accumulated sin his conscience be seared, and he has such a lethargy upon him, that he has sinned away his very sense and reason! We know that there is a God by his WORKS, and this is so evident a demonstration of a Godhead, that the most atheistic spirits, when they have considered these works, have been forced to acknowledge some wise and supreme maker of these things. We will begin with the creation of the glorious fabric of heaven and earth. Surely, there must be some architect or first cause. The world could not make itself. Who could hang the earth on nothing, but the great God? Who could provide such rich furniture for the heavens, the glorious constellations, the skies bespangled with such glittering lights? We see God's glory blazing in the sun, twinkling in the stars. Who could give the earth its clothing, cover it with grass and corn, adorn it with flowers, enrich it with gold? God alone. Job 38:8. Who but God could make the sweet music in the heavens, cause the angels to join in concert, and sound forth the praises of their Maker? "The morning stars sang together, and all the sons of God shouted for joy." If a man should go into a far country, and see stately edifices there, he would never imagine that these built themselves—but that some greater power had built them. To imagine that the work of the creation was not framed by God, is as if we should conceive an intricate landscape to be drawn by a pencil, without the hand of an artist. "God who made the world, and all things therein." To create is proper to the Deity. The wise government of all things evinces there is a God. God is the great superintendent of the world, he holds the golden reins of government in his hand, guiding all things most regularly and harmoniously to their proper end. Who that eyes Providence, but must be forced to acknowledge there is a God? Providence is the queen and governess of the world, it is the hand which turns the wheel of the whole creation; it sets the sun its race, the sea its bounds. If God did not guide the world, things would run into disorder and confusion. When one looks on a clock, and sees the motion of the wheels, the striking of the hammer, the hanging of the plummets—he would conclude that some artificer made it. Just so, when we see the excellent order and harmony in the universe, the sun, that great luminary, dispensing its light and heat to the world, without which the world were but a grave or a prison; the rivers sending forth their silver streams to refresh the bodies of men, and prevent a drought; and every creature acting within its sphere, and keeping its due bounds—we must needs acknowledge there is a God, who wisely orders and governs all these things. Who could set this great multitude of the creatures in their several ranks and squadrons, and keep them in their constant march—but HE, whose name is the Lord Almighty? And as God does wisely dispose all things in the whole regiment of the creatures, so, by his power, he supports them. Did God suspend and withdraw his influence ever so little, the wheels of the creation would unpin, and the axle break asunder! All motion, the philosophers say, is from something that is unmoveable. As for example, the elements are moved by the influence and motion of the heavenly bodies; the sun and moon, and these planets, are moved by the highest orb, called Primum Mobile; now, if one should ask, Who moves that highest orb, or is the first mover of the planets? It can be no other than God himself! Man is a microcosm or lesser world. The excellent context and frame of his body is wrought as meticulously as needlework. "You made all the delicate, inner parts of my body and knit me together in my mother's womb." This body is endowed with a noble soul. Who but God could make such a union of different substances as flesh and spirit? In him we live, and move, and have our being. The living motion of every part of the body shows there is a God. We may see something of him in the sparkling of the eye; and if the cabinet of the body be so curiously wrought, what is the jewel—the soul? The soul has a celestial brightness in it; as one says, "It is a diamond set in a ring of clay." What noble faculties is the soul endowed with! Understanding, Will, Affections—are a mirror of the Trinity, as Plato speaks. The matter of the soul is spiritual, it is a divine spark lighted from heaven; and being spiritual, is immortal, as Scaliger notes; "the soul does not wax old," it lives forever. Who could create a soul ennobled with such rare angelic properties, but God? We must needs say as the Psalmist, "It is he who has made us, and not we ourselves." We may prove a Deity by our CONSCIENCE. Conscience is God's deputy or viceregent. Conscience is a witness of a Deity. If there were no Bible to tell us there is a God—yet conscience would. Conscience, as the apostle says, either "accuses" or "excuses." Rom 2:15. It acts in order to a higher judicatory. Natural conscience, being kept free from gross sin, excuses. When a man does virtuous actions, lives soberly and righteously, observes the golden maxim—doing to others as he would have them do to him—then conscience approves, and says, "Well done!" Like a bee it gives honey. Natural conscience in the wicked accuses. When men go against its light they feel the worm of conscience. "Alas! What scorpion lurks within?" -Seneca. Conscience, being sinned against, spits fire in men's faces, and fills them with shame and horror. When the sinner sees a handwriting on the wall of conscience, his countenance is changed! Many have hanged themselves to quiet their conscience. Tiberius the emperor, a bloody man, felt the lashes of his conscience; he was so haunted with that fury, that he told the senate, he suffered death daily. What could put a man's conscience into such an agony, but the impression of a Deity, and the thoughts of coming before his just tribunal? Those who are above human laws, are subject to the checks of their own conscience. And it is observable, the nearer the wicked approach to death, the more they are terrified. Whence is this but from the apprehension of approaching judgement? The soul, being sensible of its immortal nature, trembles at him who never ceases to live, and therefore will never cease to punish! That there is a God, appears by the consent and universal suffrage of all men. "There is no nation so barbarous," says Tully, "as not to believe there is a God." Though the heathen did not worship the true God—yet they worshiped a god. They set up an altar, "To the unknown God." Acts 17:23. They knew a God should be worshiped, though they knew not the God whom they ought to worship. Some worshiped Jupiter, some Neptune, some Mars. Rather than not worship something, they would worship anything. That there is a God, appears his prediction of future things—that is, by fulfilled prophecy. He who can foretell things which shall surely come to pass, is the true God. God foretold, that a virgin should conceive; he prefixed the time when the Messiah should be cut off. He foretold the captivity of the Jews in Babylon, and who would be their deliverer. God himself uses this argument to prove he is the true God, and that all the gods of the heathens are fictions and nullities. To foretell things contingent, which depend upon no natural causes, is peculiar to Deity. That there is a God, appears by his unlimited POWER and SOVEREIGNTY. He who can work, and none can hinder—is the true God. Only God can do so. "I will work—and who shall hinder it?" Nothing can hinder action but some superior power; but there is no power above God! All power that is, is by him, therefore all power is under him. He has a "mighty arm." He sees the designs which men drive at against him, and plucks off their chariot wheels; he makes the diviners mad. He cuts off the spirit of princes; he bridles the sea, gives check to the leviathan, and binds the devil in chains. He acts according to his pleasure, he does what he will. "I will work, and who shall hinder it?" There are devils, therefore there is a God. Atheists cannot deny but there are devils, and then they must grant there is a God. We read of many possessed of the devil. The devils are called in Scripture "hairy ones", because they often appeared in the form of goats or satyrs. Now, if there is a devil, there is a God. Socrates, a heathen, when accused at his death, confessed, that, as he thought there was an evil spirit, so he thought there was a good spirit.